Paulo Bellinati The Guitar Works Of Garoto PDF + Mp3 CD download. Volume 1 & 2. The pieces gathered in these two volumes were taken from original manuscripts and from recordings of Garoto’s own playing. The rhythms and melodies are seductive, the harmonies sophisticated, and the overall effect is thoroughly captivating. The publications include a wealth of helpful information about the composer and the pieces. No guitarist interested in Brazilian music should be without these volumes. His interpretations reflect the best of the Brazilian tradition – romanticism, intimacy and rhythmic sensuality. Gems from a composer much ahead of his time – a pioneer of the bossa nova style due to his harmonic complexities and rhythmic innovations. 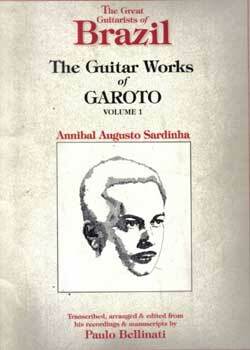 Download Paulo Bellinati – The Guitar Works Of Garoto PDF free and other books from our site. Only high quality PDF scans. Please write a review, it's important for our community.